Tourist visa (short staying time) It's what you need to enter Vietnam! Available one-month single-entry visa (maximum stay in Vietnam of one month). 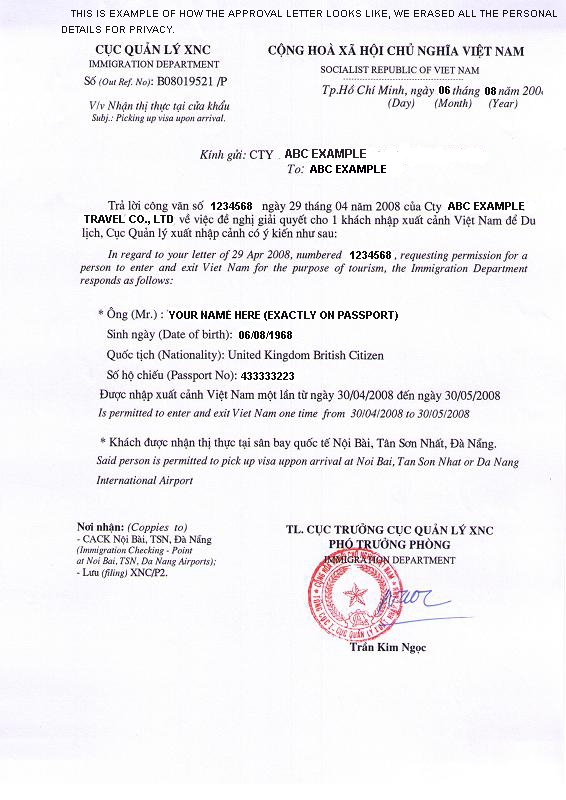 Tourist visa may be extended one time for 30 days after your arrival in Vietnam. If you plan to spend more than a month in Vietnam, or if you plan to exit Vietnam and re-enter from Cambodia, Laos or China, you will need a three-month multiple-entry visa with the approval from local agents. Business Visas Business visas arc usually valid for three or six months, allow multiple entries and the right to work. Getting a business visa has now become cheap and easy, although prices are about double those of a tourist visa. It is generally easier to apply for a business visa once in Vietnam, after having arrived on a tourist visa. Student visas A student visa is usually arranged after your arrival. It's acceptable to enter Vietnam on a tourist visa, enrol in a Vietnamese language course and then apply at the immigration police for a change in status. In reality, the easiest way to do it is to contact a travel company and have them help you make the application. Visa Extensions If you've got the dollars, they've got the rubber stamp. Tourist-visa extensions cost as little US$10, but it is easier to pay more and sort this out through a travel agency. Getting the stamp yourself can be a bureaucratic nightmare. The procedure takes two or three days and you can only extend one time for 30 days. In theory you should be able to extend your visa in any provincial capital. In practice it goes smoothest in major cities, such as HCMC, Hanoi, Danang and Hue, which cater to mass tourism. Re-Entry Visas It's possible to enter Cambodia, Laos or any other country from Vietnam and then re- enter without having to apply for another visa. However, you must apply for a re-entry visa before you leave Vietnam. If you do not have a re-entry visa, you will have to go through the whole Vietnamese visa nonsense again. Re-entry visas are easiest to arrange in Hanoi or HCMC, but you will almost certainly have to ask a travel agent to do the paperwork for you. Travel agents charge about US$25 for this service and can complete the procedure in a day or two.